Become the ultimate secret agent with the Spy Gear Alpha Bundle! This kit includes four valuable Spy Gear devices to help you navigate through your missions and remain undetected! The Mission Alpha Bundle comes with Night Goggles, Tactical Mirror, Spy Recording Pen and Motion Alarm. The Night Goggles feature built-in LEDs and a zoom lens for completing missions at night. The Tactical Mirror lets you see around corners while remaining hidden, and the Spy Pen records top secret audio for an instant replay. And if you don’t want any surprises, strategically place the Motion Alarm to sound off a warning if anyone gets too close. Gear up and become the ultimate secret agent with the Spy Gear Mission Alpha Bundle! Gear up with the Alpha Bundle from Spy Gear! 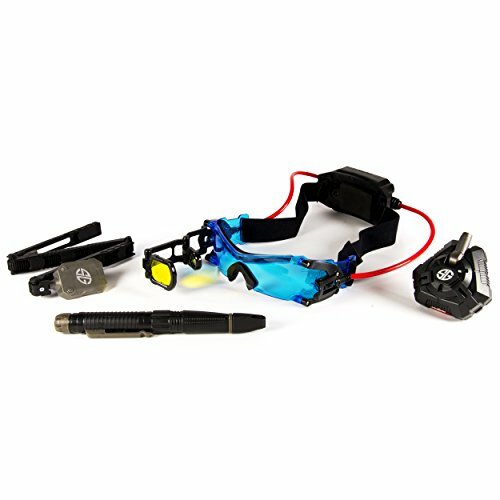 The Alpha Bundle comes with The Night Goggles, Tactical Mirror, Spy Recording Pen and Motion Alarm. Record audio or write secret messages with the Spy Recording Pen. Strategically place the Motion Alarm to send a warning if anyone gets too close! The Spy Gear Alpha Bundle is for ages 6+. 3 LR44 Batteries included. 5 AAA batteries required for operation. AAA batteries not included. If you have any questions about this product by Spy Gear, contact us by completing and submitting the form below. If you are looking for a specif part number, please include it with your message.